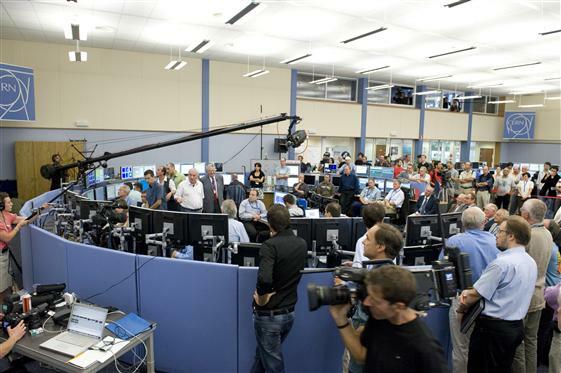 At CERN today, we had not only the LHC start-up, but also Media Day. 250 or so journalists registered for access to the Globe -- a large, spherical, wooden building that housed Internet access, live feeds from the Control Center, and a talk by the current and many former Director Generals. They could also take shuttles (just the mini-bus kind -- this ain't a Dan Brown book!) to the four major experiments and the Control Center itself (pictured). I couldn't help thinking...man, that'll be a real bummer if they don't manage to get the beam all the way around. A very public failure indeed. And, judging by LHC head honcho Lyn Evans's first reaction to their success -- relief rather than triumph -- I suppose that many of the physicists and the technicians on the accelerator felt the same way about it. Personally, I think this Media Day, while important to bring attention to the LHC, is some evidence of the arrogance that physicists are known for. They've never done this before. But they are pretty sure that once they get down to it, they're going to do it right. So, they invite journalists from all over Europe and beyond to watch their first attempt, and wouldn't you know, it goes off almost without a hitch. They worked up to sending the beam all the way around the 16.6 mile ring, sector by sector (adding on a new sector each time -- they can't stop and start it). Beginning at 9:30 a.m., they sent a bunch of protons all the way around at about 10:15. Easy. Applause and whoops went up in the Control Center. There was a small problem with cooling shortly after 11:00 a.m., but they got it under control quickly enough to send a beam around the opposite direction as well, in the afternoon. This feat, which was just icing, they also managed in about an hour. It's enough to put me in mind of Kid Rock's "Cocky" (we'll go with the edited version). and you back it up."